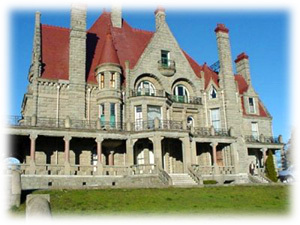 Located a short drive or a leisurely walk from the downtown harbour, just off Fort Street at 1050 Joan Crescent, Victoria, BC, Canada, Craigdarroch Castle is a beautiful historic Victorian-era mansion, built in the 1890s by wealthy BC coal baron Robert Dunsmuir. It is now owned by the Craigdarroch Castle Historical Museum Society and almost totally funded by its 150,000 annual visitors. 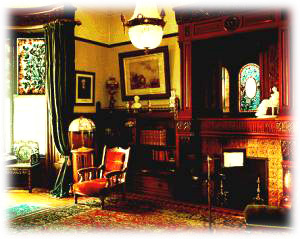 Craigdarroch Castle was built as the home of Robert Dunsmuir, the richest man in nineteenth century British Columbia. The Castle was designed by Portland, Oregon architect, Warren H. Williams. Williams died only four months after construction began on the Castle. The responsibility for building Craigdarroch Castle was given to and successfully completed by Williams’ associate, Arthur L. Smith in 1890. The Drawing Room features hand-painted and stencilled ceiling decoration with lions’ heads, garlands, birds and bouquets. The Entrance Hall and Dining Room are panelled with rich golden oak imported from Chicago. The Castle’s windows represent the largest and finest in-situ collection of residential stained glass in Canada. The story of the Dunsmuir family and their rise from humble beginnings to the pinnacle of wealth and power in western North America is complex and fascinating. Theirs is a story of profound courage and achievement, ultimately ending in tragedy. Robert Dunsmuir died in April 1889, more than a year before the Castle was completed. After his death, his sons, James and Alexander, assumed the melancholy task of finishing the Castle for their widowed mother. 10 months after Joan’s death in 1908, Craigdarroch was sold and the contents were auctioned off. For sixty years, the Castle housed various public institutions. It was once a Military Hospital and was known as Victoria College for twenty-five years. 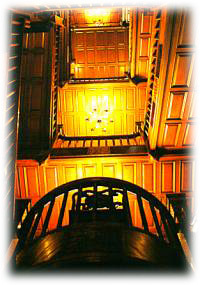 The building is now owned and being restored by the Craigdarroch Castle Historical Museum Society.